I'm developing an IOS app that creates files on the device, e.g. with NSKeyedArchiver. During Android development it's possible to browse a device filesystem when it's connected to your workstation via USB, for instance to help with troubleshooting your app. However for IOS I don't see anything similar under the Organizer in Xcode, to help me browse files my app creates from the workstation. Googling "iOO browse device files", "iPhone view files" etc. reveals solutions for jailbroken devices but not for regular devices provisioned for development. How can I browse files on a device created by an iOS app I'm developing? In Xcode's Organiser, go to your device's Summary tab. Find your application in the list, and click the disclosure triangle. Under it, you should see an icon saying "Application Data". Click the down pointing arrow to download the data, and it'll prompt you for somewhere to save it. In Xcode 5, listed under your device in Organizer, click on "Applications" and you can see "Data files in Sandbox" in the bottom half of the window. In Xcode 6, go to Window -> Devices, select the device, select the app name under Installed Apps, click the settings gearbox, then select Download container.... In finder, double finger tap the package and select Show package contents. 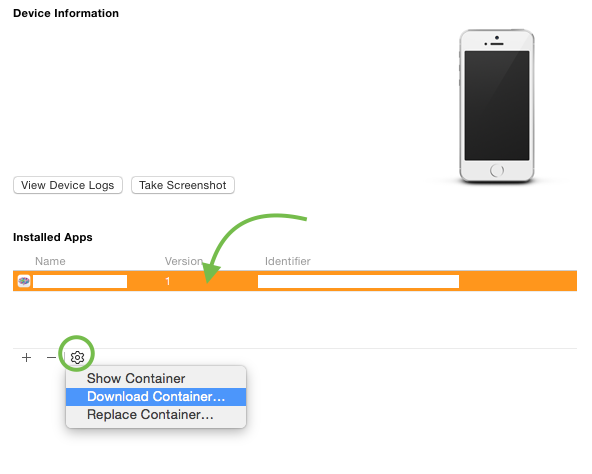 Then, select the app (in Installed Apps) and then click the gear icon and select Download Container. Pls note, that you can view contents of downloaded .xcappdata container by right click on it and select "Show Package Contents"
In Finder, "right-click" the downloaded file and Show Package Contents to open it in a new Finder window. I hope it's useful. Peace. Not the answer you're looking for? Browse other questions tagged xcode ios or ask your own question. “Pull” iPhone App Data into Xcode? How can I access my app's temp files with Xcode? How to access data from third party app? How to connect a device, enable it for development, and add it to the Member Center using the organizer?